Etak’s story begins on a racing yacht off the coast of California in 1983. The yacht’s owner was serial Silicon Valey entrepreneur Nolan Bushnell, who along with Ted Dabney founded Atari and introduced the world to Pong. Along for the race was Stan Honey, an engineer and seasoned yachtsman signed on as navigator. Bushnell and Honey began brainstorming how to turn the navigation system Honey had built for the yacht into a land-based system. By the end of the race, Honey had the rough design for a system and a promise from Bushnell to bankroll its development. From his navigation experience, Honey knew the challenges of dead-reckoning, the navigational technique that depends on keeping track of the distance and direction traveled from known positions, or fixes. Small errors in measuring either distance or direction of travel would accumulate until position couldn’t be determined with any reliability. Honey figured that correcting for dead reckoning errors in a car navigation would be easy because drivers are generally constrained to roads; correlating the current assumed position to the nearest roadway would provide a constant series of fixes and keep the system on track. The company Honey formed to commercialize this idea was called Etak, after a term used by aboriginal Polynesian mariners for moving navigational reference points. The task faced by Honey and his team was formidable. Not only was the computer hardware of the day limited, the map database needed for his “augmented dead reckoning” system didn’t exist. The computer problem would turn out to be less of an issue than the maps. An 8088-based machine running at 4.77 MHz with 128 kB of RAM was stuffed into a shoebox-sized case for the vehicle’s trunk. The team found that traditional raster CRTs didn’t have the resolution needed to show map details, so they built a vector-based display like the one used on Atari’s Asteroids video game. Keeping track of the vehicle’s direction and distance traveled was the job a pair of sensors. A fluxgate compass mounted on the vehicle’s rear windshield kept track of heading relative to magnetic north, while a pair of Hall-effect sensors mounted to the non-driven wheels counted off the miles. The wheel sensors also provided additional vector data by keeping track of the difference in rotational speed as the vehicle cornered. Mass storage for the map data was another matter entirely. Hard drives of the day were expensive and bulky and singularly unsuited for life in the trunk of a car. CD-ROMs were years in the future, and floppy drives didn’t have the capacity needed to hold a usably large block of map data. After much experimentation, Honey’s team settled on a modified version of the standard audio cassette tape drive. 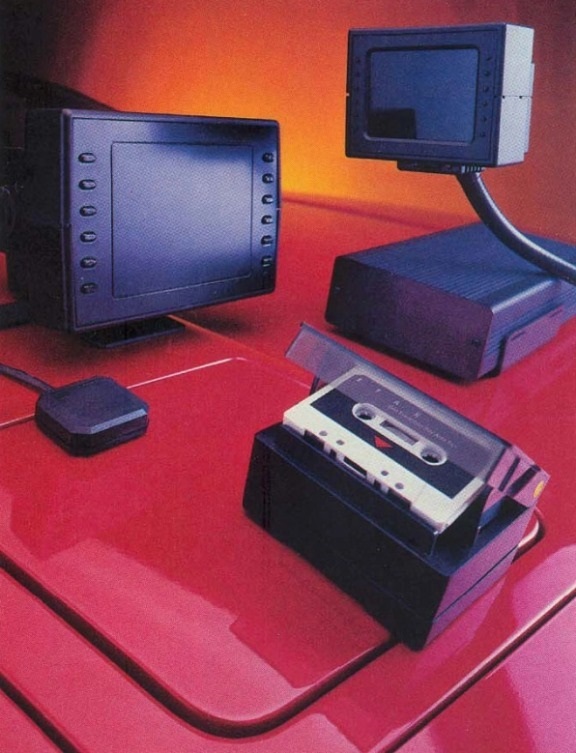 A high-speed, random access drive using ruggedized cassettes was placed within reach of the driver, who would need to swap tapes when the limits of a particular map block were reached. Each cassette held 3.5 megabytes, which was pretty impressive at the time. But exactly how to populate those tapes with maps was by far the thornier problem. Honey had an acquaintance working at the United States Census Bureau on digital mapping, Marvin White, and persuaded him to join the team. Together with teams of digitizers, they turned public domain paper maps into digital models, using scanners and custom digitizing software. They started with the area around the company’s Silicon Valley headquarters and expanded to major metropolitan areas around the U.S.
Storing the data on the tapes turned out to be a major challenge, and a breakthrough in storage technology. White’s knowledge of digital mapping and the mathematical field of topology led to a hierarchical approach to storing the map data, where the physical location of the data needed for the next turn or waypoint was most likely stored very close to the current tape position. This made Etak’s geocoding algorithms much more efficient than anything that had come before, and would be the key to the long-term success of the company after the GPS revolution. Etak’s first product, the Navigator, came in two flavors. Model 450 had a small 4.5″ vector display and retailed for $1,395, while the Model 700 sported a spacious 7″ screen and a $200 premium. Each map cassette went for $35. Given that six tapes were needed just for the Bay Area map, the Etak was not exactly consumer-friendly. Still, it had a number of deep-pocketed early adopters, including Michael Jackson and former child star Gary Coleman. In the end, though, the consumer market didn’t create nearly the demand as the public service and commercial transportation markets, which were attracted to street-level detail provided by Etak’s geocoding system. 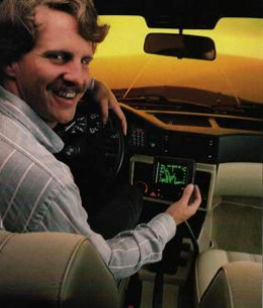 With something like 5,000 units sold by the late 80s, the days were numbered for Etak’s Navigator. As the U.S. government continued to build out the NAVSTAR global positioning system, it was clear that what was once a closely held military secret would one day be opened up to public use, and Etak saw the writing on the wall. They realized that the true value in their company was the digital map data, and in a move many companies would not have had the guts to take, they got out of the hardware business altogether and focused on their digital maps. Certain readers will likely remember that early Mapquest maps bore a small Etak copyright, and with the eventual sale of the company to TomTom, their mapping technology lives on to this day. Etak Navigators may look quaint by today’s standards, but the technology Stan Honey developed unlocked digital mapping and set the stage for the GPS revolution that soon followed. Native American Tribe Wheredafugarewe used dead reckoning also..
You think there aren’t markers in the “wilderness”? People were nomadic and traded with each other, so there was lots of travel. Just recently a map was uncovered that was given to Lewis & Clarke that was made by a native. Places had names, mostly erased when the Europeans came over, though ironically sometimes replaced by other native words. People didn’t write things down, but they remembered. Even today, we find our way without maps, maybe not fully understanding how we do it, but probably noticing things like where the sun is and obvious landmarks. The point is to put yourself in my great, great great grandmother’s mind, and then you start seeing that things weren’t that different, and certainly not reason to make cheap jokes. Similar solution to similar problem. Flesh or silicon. But I hear that tribe has been wandering about in the pages of obvious bad humor, and probably wont find their way back home. A tragic tale. You’ve got the tribe’s name wrong. That’s OK, it happens to the best of us. thanks, that was very informative, it makes the article complete. Regarding “traditional raster CRTs didn’t have the resolution needed to show map details” is not completely correct if you ask me. Using vector based graphics you can create higher resolution graphics with less “effort” and and data. It has nothing to do with the CRT itself but merely by the way the data is send to it and how the screen looks when you’re done drawing. Because drawing lines only where they should be drawn instead of drawing a raster of dots. And considering that maps are very often made of lot’s of lines, a vector display is very suitable for this task. But vector display aren’t perfect all the time as the vectrex gaming system of the 80’s showed us (very fun system). Anyway, in the end it is still the same old phosphor tube and most likely with very similar deflection coils. how would a vector CRT display be a “traditional RASTER CRT”??? If Folgers ran the world. I never get lost, my wife always tells me where to go. I’m pretty sure KITT had a moving-map display of some sort. Side note, I worked on the show and witnessed a crash. Awesome..
Durrrr, apparently was already linked in the comments early. My bad. Thanks, Keith! I wish my android would work when I zoom out, like Etak. I am forced to recenter which rezooms-in too much in many cases, or I must move the map manually to keep pace. Any cheap used analogue oscilloscope capable of X/Y mode is a vector display. The better ones also have a Z (blanking) input. Like Asteroids and Space War which came earlier the vector graphics monitors used a magnetic deflection tube with a feed-forward compensation for the inductance of the coils and curvature of surface for X and Y. They pulled off about 2 to 3 MHz bandwidth down to DC. I have a 19 inch Battlezone monitor and schematics gathering dust, wanted to make audio vectorscope. Now I use Soundcard Ozilloscope. Another back burner project is a cute 5 inch portable EEG ECG monitor which has a slow phosphor and of course magnetic deflection. It is a breadboard mess of a spectrum display for AM to about 2.4 meg and FM radio into the air band. Paper scroll map , connected to the speedometer. Any one remember the Hertz Rental car “navigation” system “NEVER LOST? ?” it had a stalk mounted display / keypad mounted between the front two seats and a satellite antenna on the trunk deck both connected to a home stereo receiver sized box in the trunk. It apparently used a digital map customized for the normal area renters would drive to and it was common to do two or actually three things routinely : 1. Get hopelessly lost as the routes were NEVER the route any sane person would use (hence the service group I worked for called the thing NEVER FOUND!) 2. Drive “off the map” which was done by driving around 60 or 75 miles from the rental location. I rented in Philadelphia P.A. and drove to Princeton N.J. only to find there is no where to eat, shop, bank or stay at least according to never lost anywhere in the Princeton area! Same if I rented in Indianapolis and drove to Champaign Il.!! 3. By taking the time to try using the system for real directions to a customers site, and then remember item 1 , you would arrive more than fashionably late as the trip most often ended after getting directions from another source and the painful explanation to the direction givers response YOU are WHERE?? Why you trying to get to xxxxx From there boy you are LOST!! Makes the GPS voice “Recalculating” and “Please proceed to the high lighted route” seem acceptable and pleasant! I got a car with one of those once. Couldn’t figure out how to make it do anything useful, including turn off (it kept coming on every time I started the car). As it was night time, the glare from the thing was annoying as heck. I was glad I’d brought my Garmin.